Power out and want a grilled sandwich? No problem, just grab your cast iron skillet and put it on the woodstove. 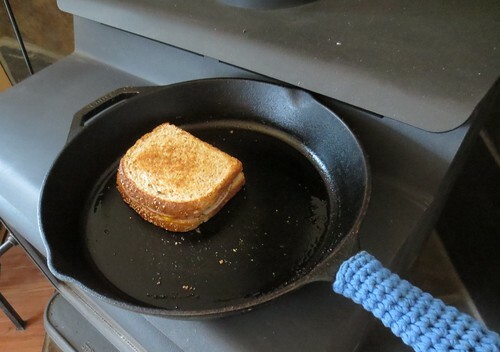 Here is a closeup of the ham and cheese sandwich grilling nicely on the woodstove top. You might of noticed the handmade skillet handle cover. This handle cover is crocheted from an old tee-shirt. Full pattern directions found here for the cast iron handle cover. These handcrafted handle covers work great on cast iron pots and skillets. I love that you can just leave the handle cover on as you cook in the pan. 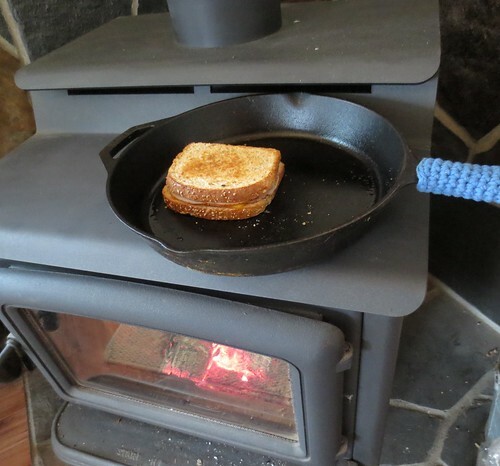 So should you find yourself out of power as we did today, you can always grill up a nice and hot sandwich on your woodstove top. Even if the power isn’t out, this is an useful idea for anyone wanting to try their hand at woodstove cooking. We enjoy our leftover pizza warmed up. The problem is that most people microwave it to warm it up. Microwaving leftover pizza tends to leave it soggy and the crust limp. If you read this blog occasionally, you will know that I love and use cast iron skillets and pots for cooking and baking quite often. I love my cast iron pans and find new uses for them all the time. 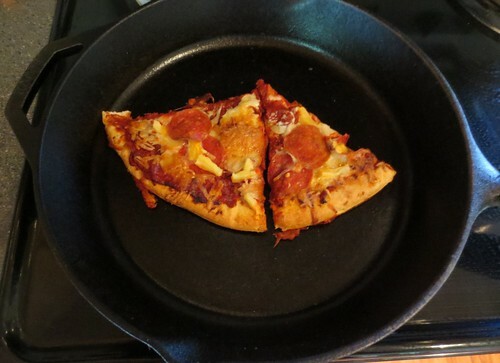 So… I figured I would try putting a few pieces of leftover pizza in my big skillet to warm it up. In my first attempt, I scorched the bottom of the pizza crust. I found you want to keep the heat lower and allow extra minutes to warm the pizza slowly. My 2nd attempt warming pizza in the cast iron pan turned out wonderfully. Not only does the crust stay nice and crisp but the topping heats up and everything turns out great. Tasted almost like freshly baked pizza. So here are the details for successfully warming pizza in a cast iron skillet.